Starting yesterday, Cortana support began rolling out to Skype users in the US. This new capability is available for both the Android and the iOS versions of Microsoft's well-known app. Skype has been around for more than 14 years already, and it went through two major acquisitions since then. First, it was purchased for US2.6 billion by eBay in September 2005. After 6 more years, Microsoft acquired it for a whopping US$8.5 billion. In the last few years, the Redmond giant redesigned the Skype clients for all platforms, adding new features on a regular basis. Now, the time has come for US-based Skype users on Android and iOS to fully enjoy Microsoft's AI-driven assistant Cortana. An official blog post by Microsoft's Skype team reveals that Cortana in Skype will roll out in stages and that this process has begun yesterday. Cortana is now a Skype contact, so the users can carry on natural language conversations with the AI assistant and ask for various types of information. For example, Cortana can reply to questions such as "How do I get to <location>?" or "How's the weather tomorrow? ", but it can also detect when the user talks about scheduling events, and then it would recommend to set up reminders. Once a reminder is created, it can be sent to other devices that the user authorized to use Cortana. Making restaurant reservations or getting smart suggestions during a conversation is also possible. 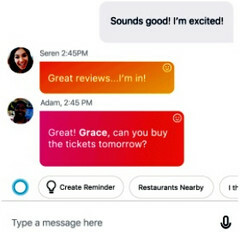 The features above are already available for Cortana users on Windows 10 devices, but Android and iOS users of the Skype app did not have access to them until now. Unfortunately, Cortana for Skype does not work in video or voice calls yet. The Skype video bots that Microsoft unveiled in a preview stage earlier this year are also in the queue and should arrive in the coming months as well. Right now, over 500 million Windows 10-powered devices can access Cortana. According to Microsoft's VP Jori Ribas, about 140 million users speak with Cortana at least once a month.